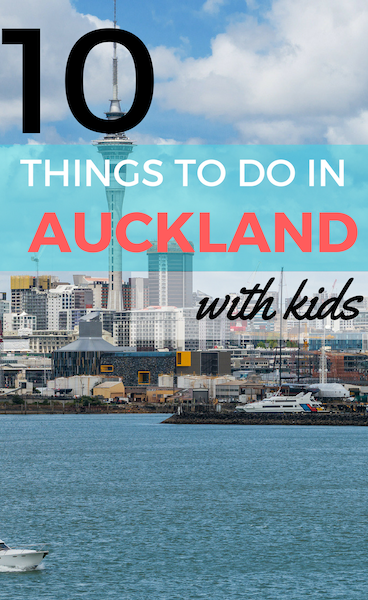 You can find Kylie’s list of top attractions in Auckland for families below. 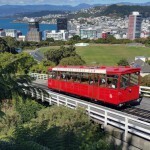 Auckland is New Zealand’s largest city, and no matter what time of year you’re visiting there’s plenty of things to do in Auckland for kids and families. 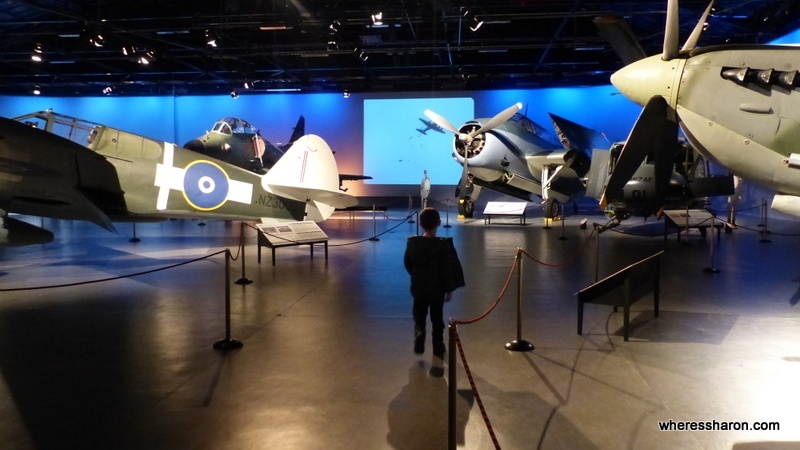 Even better, many of the top Auckland attractions are free! Here’s an insider’s guide on what to do in Auckland, including the best family accommodation in Auckland, written by a travelling family who live there. Auckland, or Tāmaki Makaurau as it’s known, is home to almost 1.5 million people and is a cultural melting pot. It’s the largest Polynesian city in the world and has over 200 ethnic groups living here which makes it officially more diverse than London or Sydney! 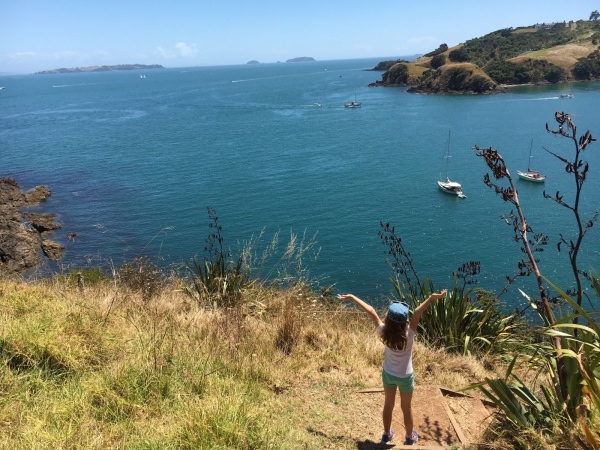 Auckland’s stunning landscape features three harbours, a lush green landscape dotted with 48 extinct volcanic cones and is incredibly family friendly. Locals affectionately refer to it as a city with four seasons in one day – the maritime climate means relatively mild winters and warm, humid summers. It rains a lot, so dress in layers and pack an umbrella. The summer months (December – March) are generally the best time to visit, but there’s still lots happening over winter. The Auckland War Memorial museum is a stunning old building that sits in the centre of the Domain, a beautiful park close to Auckland’s CBD. 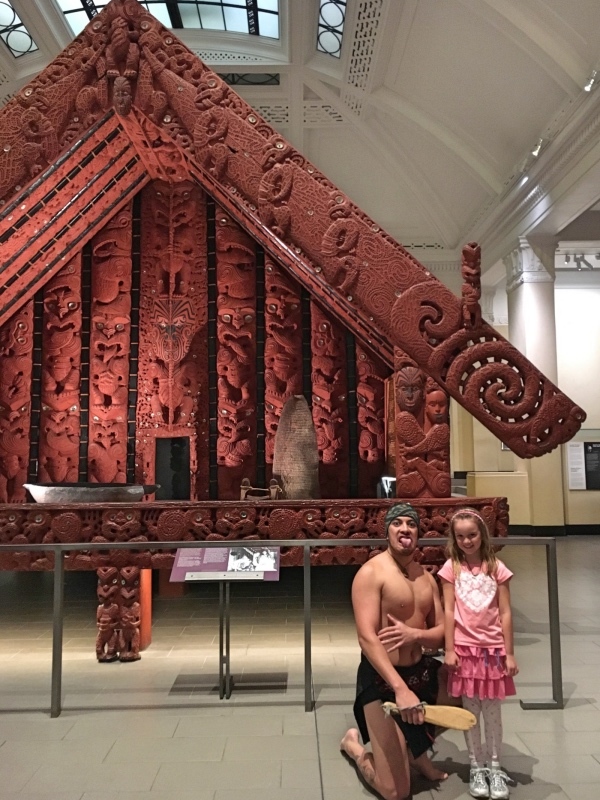 It’s a great place to visit with kids if you want an introduction to New Zealand’s indigenous Maori culture and to find out more about the relatively young history of the country. The bottom floor is devoted to Maori and Pacific culture, and our kids love going inside the whare (carved meeting house) to admire the beautiful Maori carvings. They’re always blown away by the giant waka (huge canoes carved from a single tree). A must-do for families is to visit the “Weird and Wonderful Discovery Centre”, a hands-on space where kids can touch objects from the natural sciences collection or try the digital interactive activities. Weekends are a great time to visit for younger kids as they also have interactive story-times every Saturday and Sunday. The museum has great family-friendly facilities such as the Kai Room which is a dedicated family space for eating, toilets complete with change tables and lockers to store your stuff while you wander around the museum. There’s also a cafe on site. Auckland harbour is dotted with stunning islands that are fantastic day trip destinations. The most popular is Waiheke Island, a one hour ferry ride from downtown Auckland. Waiheke has beautiful beaches, lots of family-friendly cafes, vineyards, restaurants and walking tracks. 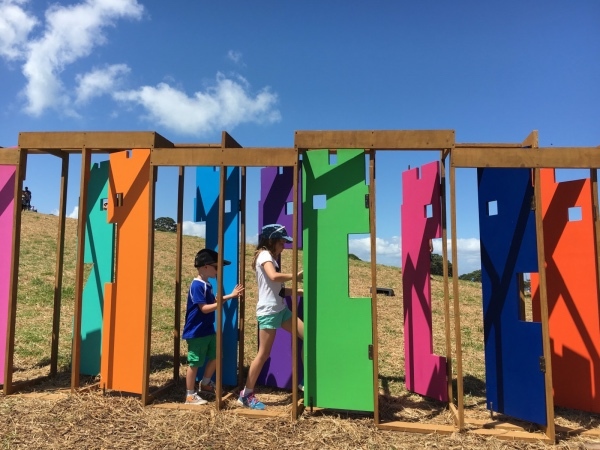 If you’re visiting in summer it’s well worth checking out the Sculpture on the Gulf trail, full of interactive art that kids will love exploring. If you have time, Waiheke is definitely worth an overnight stay. Oneroa, Palm Beach and Onetangi are all great spots for families. Rangitoto Island is actually an extinct volcanic cone in the middle of the harbour that you can see from most parts of Auckland. There are walking tracks of various lengths across the island through stunning regenerating forest that will take you to the summit for panoramic views back to the city. It’s a challenging walk (our kids managed the walk from around four years), but you can also buy tickets for a tractor train to get you to the top if it’s too far. Top tip: You will need to take all your own food and drinks over to the island as there is no shop or water supply over there. Ferries leave regularly from downtown Auckland. Butterfly Creek is a great place to visit for animal loving kids. It’s home to a tropical butterfly house featuring hundreds of beautifully coloured butterflies, and also hosts New Zealand’s only salt water crocodiles. Other animals include reptiles, fish, birds and insects. There’s also the fantastic Buttermilk Farm on site, where children can hold and pat rabbits, guinea pigs, goats, sheep, alpaca and pigs! A highlight for kids is a great playground complete with the Red Admiral express, a toy train that circles the park. Dinosaur crazy kids should be sure to visit Dinosaur Kingdom, featuring more than 60 dinosaurs, including life-size animatronics dinosaurs! There’s a nice cafe on site or you can bring your own picnic to enjoy in the playground. Top tip: Butterfly Creek is only a 3 minute drive from Auckland International Airport, so it’s a great last day activity for visitors flying out later in the day. The Sky Tower is New Zealand’s tallest building at 328 metres high and it dominates Auckland’s skyline. A trip to the top gets you 220m high, with panoramic views out over the city and up to 80 kilometres in all directions. It’s a great way to get your bearings of the city, and kids will love looking through the glass floor down onto the street far below! They’ll also get a thrill out of watching people base-jumping off the side of the tower. Top tip: It’s only worth visiting the Sky Tower if it’s a clear day, rain and fog severely restrict the view and it’s not really worth it. Kelly Tarlton’s Sea Life Aquarium is a bit of an iconic Auckland family attraction. It’s essentially an underwater aquarium where you walk through perspex tunnels to see sharks, stingrays, lots of different fish and other sea life. It’s also home to the Antarctic Ice Adventure, where you can see New Zealand’s only colony of Antarctic penguins up close. Top tip: If you’re staying near downtown Auckland then it’s worth taking the free shuttle bus to Kelly Tarlton’s – it’s a bus in the shape of a shark and your kids will love it! The Waitakere Ranges are the city’s backdrop, with 16,000 hectares of native forest and coastline on Auckland’s doorstep. There’s a number of family-friendly bush walks in the area where you can spot birds, native plants and crystal clear rivers. First head to the Arataki Visitor Centre to learn about the park before heading out to our favourite, the Cascade Kauri Park which is a short drive from the centre. 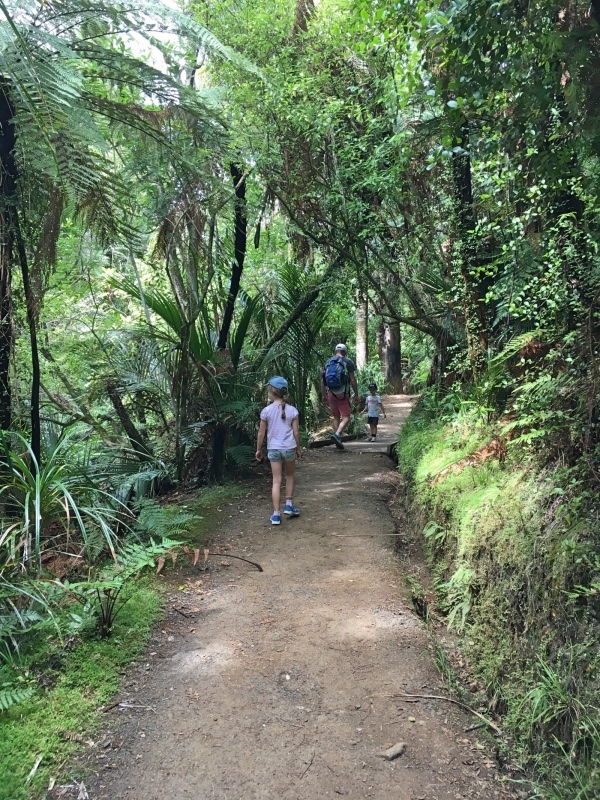 The Auckland City walk is perfect for families – a stroller friendly 1.5km loop track that gives you a taste of New Zealand native bush and giant kauri trees. Top tip: If you’re visiting in summer, look out for guided early evening “bat walks” that take you hunting for endangered New Zealand native bats and glow worm spotting in the bush. They’re run by Auckland Council and booking is essential. See also: The best places to eat in Auckland with kids. Western Park: a recently upgraded playground on the city fringe complete with mega slides, a flying fox and in-ground trampolines. 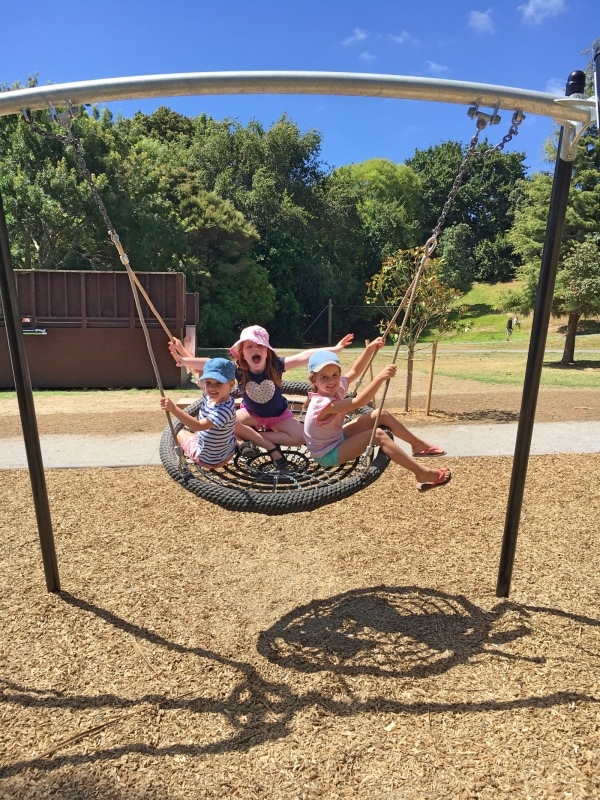 Cornwall Park: a great one for younger children, Cornwall Park situated at One Tree Hill has swings, slides, a train, climbing frames and a flying fox. It’s part of a bigger park so you can also see sheep and cows too. Rocket Park: this playground 10 minutes from the CBD is an Auckland institution, with its iconic rocket ship climbing frame in the centre. A good playground for all ages. Grey Lynn Park: another city fringe playground that’s recently been refurbished, it has swings, climbing frames, a balancing log and flying fox. During the summer months a free toddler splash pool is open for little ones to cool off. Located not far from downtown Auckland, the zoo is one of the top things in Auckland to do with kids. It has a fabulous conservation emphasis, and really helps kids to learn about the environment and wildlife. 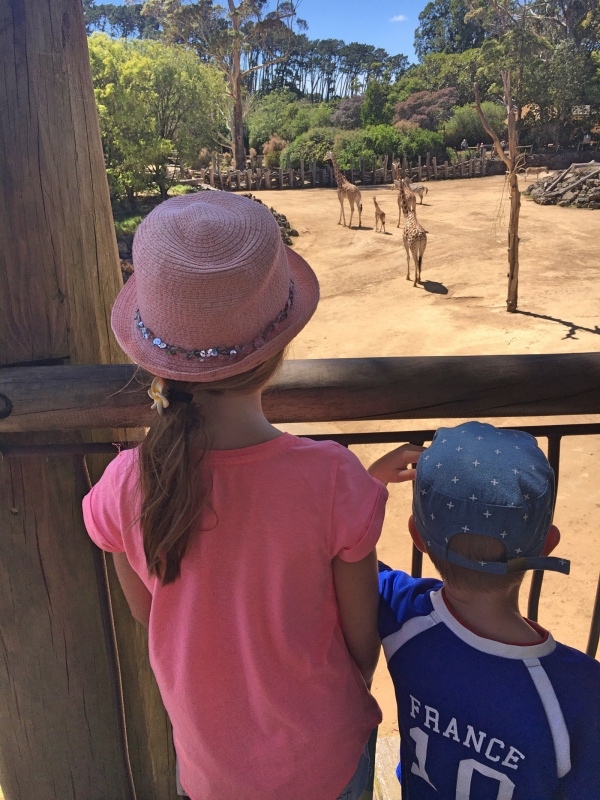 There’s plenty to fill a whole day with at the zoo, and along with the usual animals there’s a great section on both New Zealand and Australian wildlife, flora and fauna. Keep an eye on for various animal encounters that let you get up close and personal with some of the animals throughout the day. The zoo has plenty of space for a picnic, with a good cafe and smaller ice-cream and snack stands dotted throughout the park. 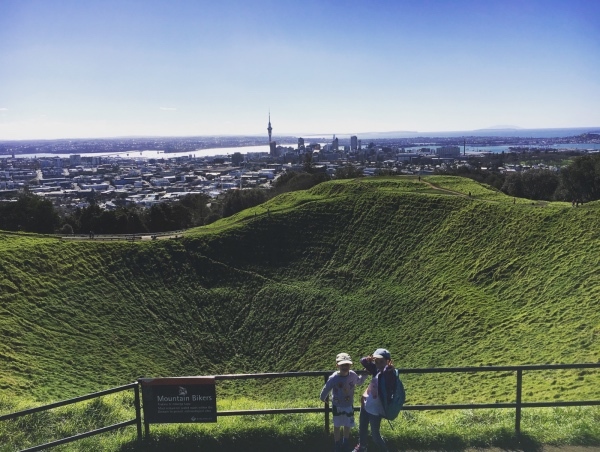 The best viewpoints in Auckland come for free and can be experienced by climbing one of the city’s 48 volcanic cones. If your kids are interested in geology and volcanoes then it’s a great activity. Some of the best include Mt Eden (Maungawhau) which has a great example of a steep crater, One Tree Hill (Maungakiekie) which is arguably the best viewpoint of the whole city and sits in the beautiful Cornwall Park. North Head (Maungauika) has fabulous views out over the harbour and tunnels and military installations left over from World War Two – perfect for a game of hide and seek! Auckland’s Botanic Gardens are a bit of an overlooked gem, and it particular the Potter Children’s Garden is a great place to head for free family fun. The garden is an educational but fun way for children to learn about plants and ecology, and some of New Zealand’s stunning native varieties. Kids will love learning how to tell the time via a sundial, look for frogs in the stinky bog and go hunting in the grub pit! The Botanic Gardens are huge and there’s plenty of space for families to have a picnic and little ones to run around and practice doing cartwheels on the lawn. There’s a good cafe on site also. Top tip: It’s a little tricky to visit the Botanic Gardens via public transport, so a hire car is best for this one. Sky City Grand Hotel – Right next to the Sky Tower, the Sky City Grand Hotel has one of the best locations in the city. It’s handy for all city attractions and a short walk to the harbour. There are lots of great restaurants nearby. Click here to see the latest prices. Hilton Auckland – If you want to stay right on the harbour and at the hub of all the downtown area action then the Hilton is a great choice. Close to all the restaurants and cafes in the Viaduct and Britomart precincts. Click here to see the latest prices. Adina Apartment Hotel – A great hotel for self-catering families, in a handy location that’s a short walk to downtown Auckland. Click here to see the latest prices. The Langham Hotel – Auckland’s most luxurious hotel and located at the top of town close to the Museum and Domain parks. It’s definitely worth splurging for high tea here! Click here to see the latest prices. Quest Serviced Apartments Ponsonby Road – A great location on Auckland’s premier restaurant and cafe strip and across the road from Western Park playground. Click here to see the latest prices. Spencer on Byron Hotel – Over on Auckland’s North Shore in Takapuna a great seaside village with a fabulous beach for kids to play on and great views over to Rangitoto Island. Click here to see the latest prices. You can find Kylie at https://www.ouroverseasadventures.com and follow her on Facebook and Instagram. Have you visited any of the above destinations? 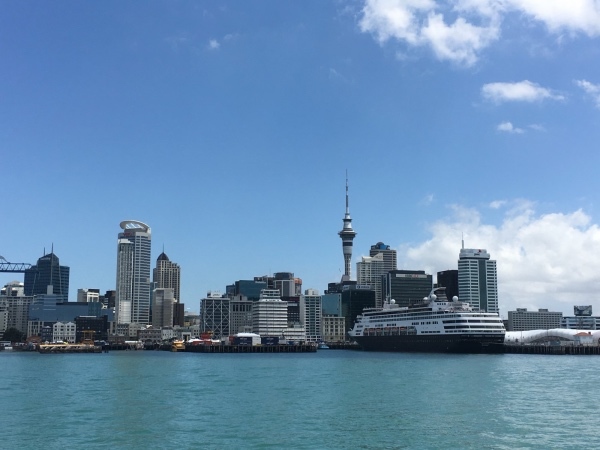 Want to read about other cities in New Zealand? You can read our other guides to Wellington and Christchurch. Disclaimer: This article contains affiliate links. This means that if you make a booking after clicking on one of these links then we may receive a small commission at no extra cost to you. 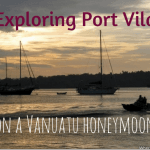 Want to Know the Best Pacific Island to Visit? Kylie Gibbon is a passionate traveller and foodie who's been to over 45 countries around the globe. The Our Overseas Adventures blog chronicles her family travels with her husband and 5 and 7 year olds in tow, including an 8-month sabbatical through SE Asia, Europe, and the Middle East in 2016. Now based back in New Zealand, the family is continuing to travel as much as possible and are always planning their next adventures! This is the best list i have seen till date the things to do with with your children.. Great things can be done. 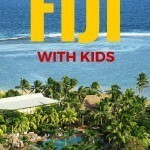 How do you substantiate that you are the most popular family travel blog online, like you claim? Hi Rebecca! This list is formed by submitting Google Analytics data and the majority of top travel blogs do. YOu can see how we are ranking currently. Congrats Sharon! Hope you and your family have many more fun travels! Hi Sharon, please feel free to visit our science museum for younger children; My Science Playroom in Auckland. It is quite unique and geared towards families with younger children, with lots of hands on activities. It is great fun for parents and other family members who visit to engage in a little play and exploration too. Thanks for visiting and enjoying the blog! Auckland looks amazing. We took the kids to Australia last year, because New Zealand was a longer flight (from the US) and it was too much for them. I think we will save that one for when they are a bit older. You definitely whet our appetite, though! For now, we tend to stick to locations in the US or the Caribbean, as it involves less traveling. I can recommend Barbados if you want a family-friendly vacation in the Caribbean.